Weight: 150ml / 5 US Fl. Oz. Likes: Removes stubborn makeup effectively, gentle on skin, mineral oil free!! Jenn's Rating: 5 Stars! HG Stuff!! Cetyl Ethylhexanoate, Olea Europaea (Olive) Fruit Oil, PEG-20 Glyceryl Triisostearate, Squalane, Simmondsia Chinensis (Jojoba) Seed Oil, Triticum Vulgare (Wheat) Germ Oil, Oryza Sativa (Rice) Germ Oil, Tocopherol, Chamomilla Recutita (Matricaria) Flower Oil, Citrus Aurantium Amara (Bitter Orange) Oil, Lavandula Angustifolia (Lavender) Oil, Oenothera Biennis (Evening Primrose) Oil, Water / Aqua / Eau, Rosa Canina (Rose) Fruit Oil, Limonene. 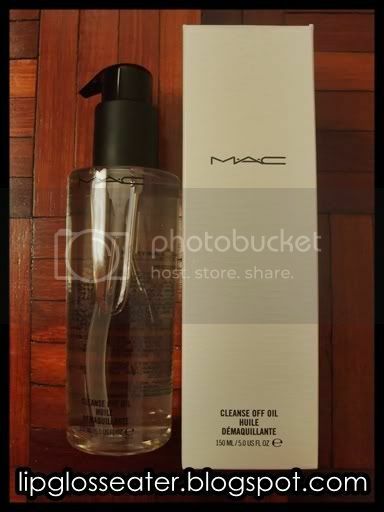 An industry-strength oil-based makeup remover that's gentle on the skin. Botanically formulated with oils of olive fruit, evening primrose and jojoba seed and absolutely 100 percent mineral-oil free. Massages onto the skin to loosen all makeup, including waterproof mascara. Emulsifies into a lotion-type liquid with water: rinses off easily, no tissues required - and no residue! Protects with vitamin E. Skin softening and conditioning. Good for all skin types. This cleansing oil is, well, oil, so its rather runny and it spreads well on your face. 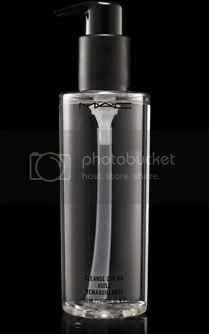 It has a citrusy scent that is unlike any other (undeniably MAC)! lol! Be careful though if you're allergic to Bitter Orange Oil, Lavender Oil or Jojoba Oil! 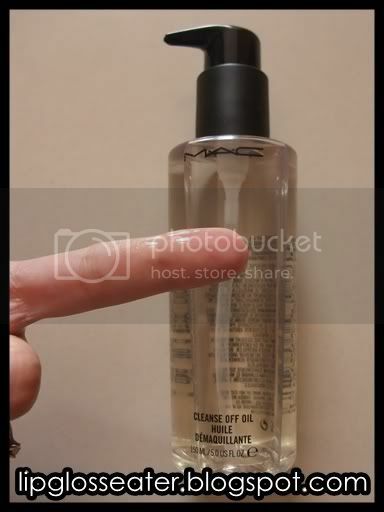 This cleansing oil comes in a clear bottle with a pump dispenser, which is really great! The pump, however, needs some getting used to! Press too hard, and you'll squirt the oil all over your sink / floor! IMPORTANT: Make sure that your face is COMPLETELY DRY, otherwise this wouldn't work!! 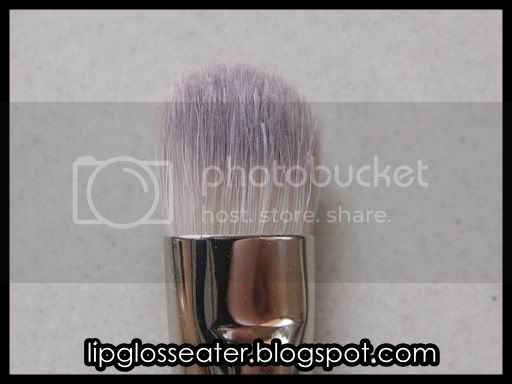 Step 2: Dip your middle finger into the oil and gently spread it over your eye area. 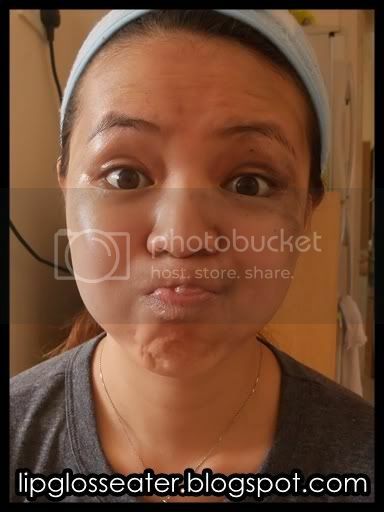 Spend some time massaging the oil around the area, and soon enough you'll see the makeup coming off. Repeat on the other eye when done. Looks like i just stepped out of a coal mine! lol!! 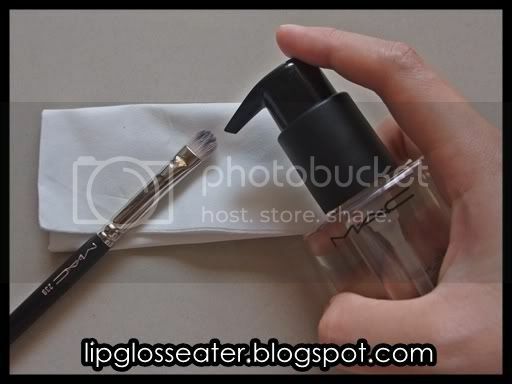 Here's another step-by-step tutorial on how to use this cleansing oil as a brush cleanser! 2. A kitchen towel or rag (Tissue paper would do if you don't have those two like me). 3. 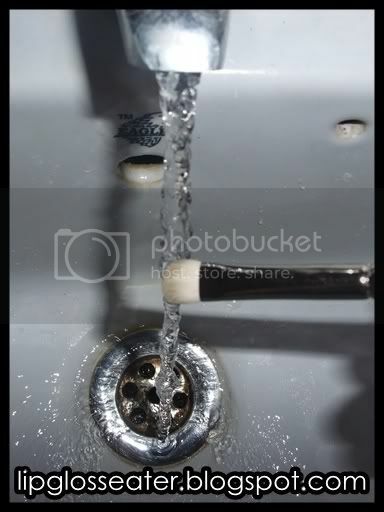 Water to rinse your brush. 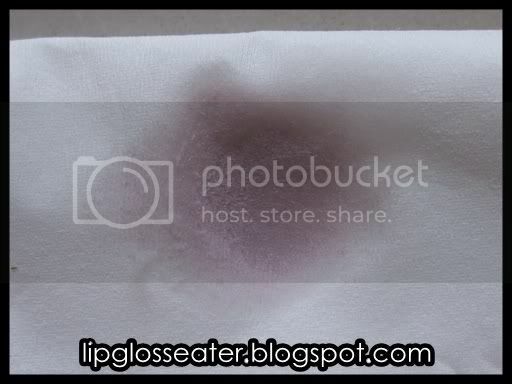 ps: you can see the tissue "disintegrating" a little already, thats is why a kitchen towel / rag would be a better choice for this!! 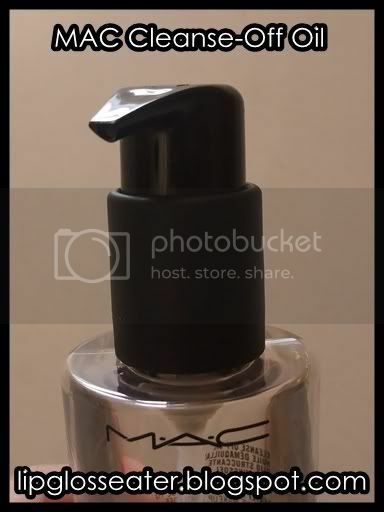 I was given a sample of this during the Barbie Loves MAC event two years ago. 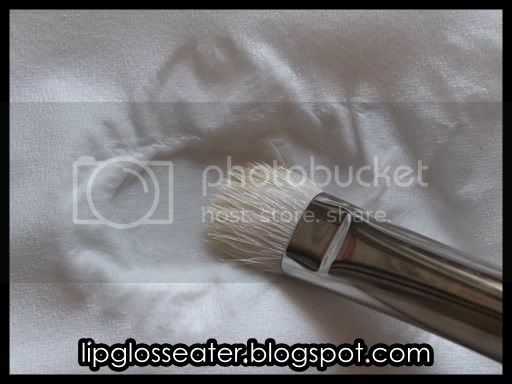 I was complaining to my MA on how difficult it is to remove the LiquidLast liner and she recommended this to me. True enough, it really takes off EVERYTHING within minutes, and my face felt soooo soft after that!! No kidding! 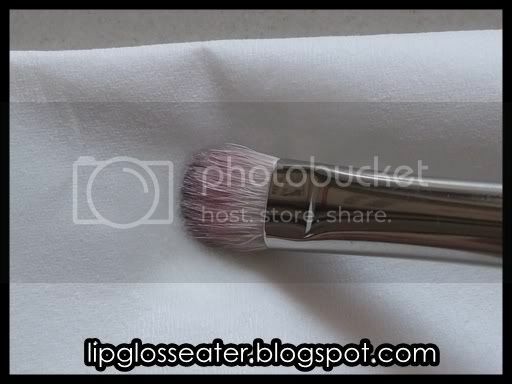 This also makes a wonderful brush cleanser, especially for those brushes for emolient products like foundation, concealer and liquid liner! 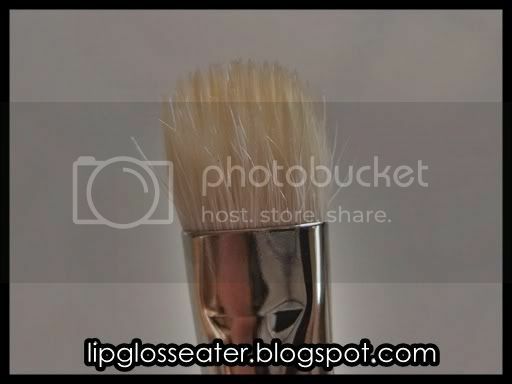 Credits: Product photo from Maccosmetics.com. you bloody cute!!! *pinches* That charcoal-ed face was priceless!! and great step by step pics! 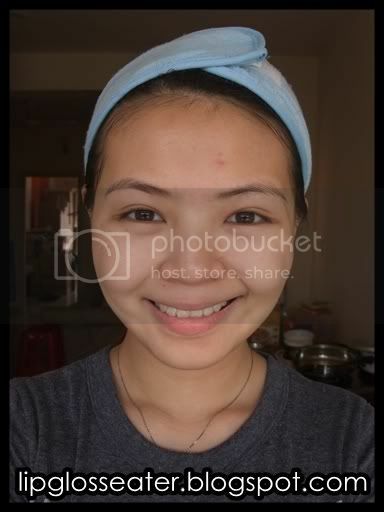 who takes your pics for u ah? timer? 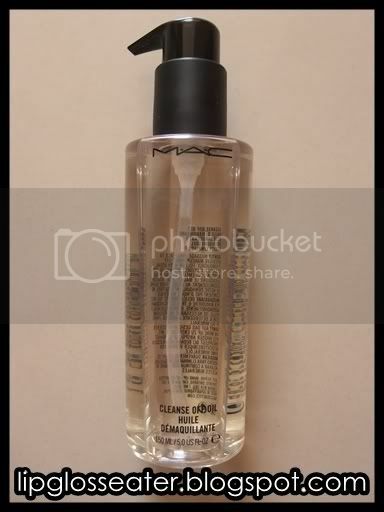 Hmmm... maybe you can go get a sample from the MAC store, since i saw that they have the tester cleansing oil there!! Better try out first before committing to a big bottle just to be on the safe side! I started using this stuff a few weeks ago. 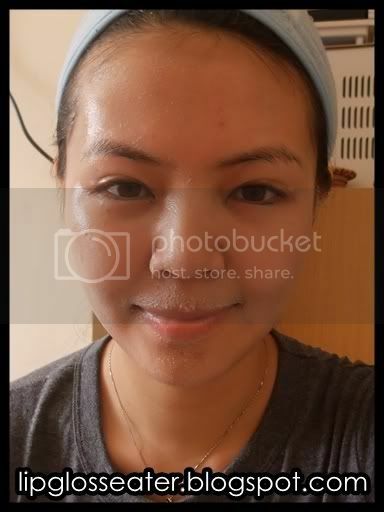 It takes off makeup SO well, and doesn't leave your face feeling oily afterwards. Skin feels soft too. Loveee it! I agree with you, Jenn. Good product. I got several small bottles (samples) when I purchased Hello Kitty stuff. really like the feeling of softness on my skin after rinsing it off with water. MAC A Rose Romance Collection now online! MAC Dazzleglass Swatches on a Good Friday!